Change up your style, while maintaining all-day-on-your-feet support with the Breech, an updated Wallaby boot. This boot features a compression molded foam core midsole for flex and cushion, flexastride memory foam insole for comfort and stability, and rugged slip resistant rubber sole for durability and grip. 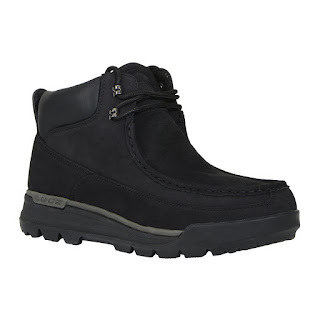 Lugz Men's Breech Boots are the perfect way to look stylish all winter long! My husband loves how comfortable these boots are thanks to the Flexastride molded memory foam insole. They're also extremely stylish and literally go with just about everything he owns. He also loves that they're easy to keep clean and that they keep your feet warm. Another great thing about them is their slip resistant rubber sole which is great this time of year. Lugz Men's Breech Boots would make a terrific gift for the guy in your life this holiday season and I highly recommend them!